A federal judge ruled Friday that a napkin-sized painting by French impressionist Pierre-Auguste Renoir -- which was stolen back in 1951 -- be returned to a Baltimore museum. U.S. District Court Judge Leonie M. Brinkema ruled against a Virginia woman who had laid claim to the painting, saying she bought it at a flea market for $7 several years ago. The woman, Marcia "Martha" Fuqua, of Loudoun County, Va., had planned to sell the painting, but the auction house pulled the listing after the Baltimore Museum of Art said it had been stolen more than 60 years ago. The FBI seized the painting in 2012 and has held it while the court sorted through the competing claims. 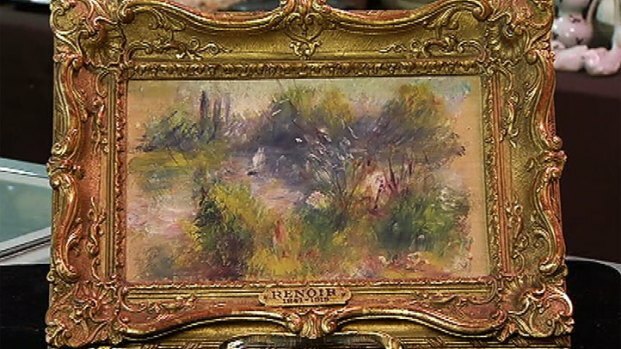 The FBI is now investigating the discovery of a Renoir painting in a Virginia flea market. News4's Derrick Ward reports. And there's another twist: Fuqua's assertion that she bought the painting -- Renoir's "Paysage Bords de Seine" -- at a flea market is contradicted by her brother. "[Our mother has] had it for a long time, probably 50 or 60 years," Fuqua's brother, Matt, told the Washington Post. "My girlfriend and her friends were cleaning out my mom's studio, and my sister stepped in and said, 'Wow, I want this.' All I know is my sister didn't just go buy it at a flea market. ...My sister kind of snagged it out of my mom’s art studio." A Virginia woman is living the dream of all collectors: A painting she bought at a flea market turns out to be the work of the impressionist master Pierre-Auguste Renoir. [Fuqua's] mother -- who goes by the professional name Marcia Fouquet in homage to a French ancestor -- is a painter who specialized in reproducing the pieces of several famous artists, including Renoir, according to an online biography and people who used to work at her art studio. The museum claimed it was the rightful owner no matter how Fuqua acquired it. Fuqua says the museum's documentation of the theft is legally inadmissible. Brinkema said Fuqua's attorney had ample opportunity to present evidence that she was entitled to the painting and didn't, ruling against going to trial, reported News4's Kristin Wright. Matt Fuqua said he approved of Brinkema's judgment. The 1879 painting's value today is estimated at $75,000 to $100,000. It was sold in 1926 to Herbert L. May, whose wife, Saidie, loaned it to the museum in 1937. It was there for about 14 years before it was stolen, according to records uncovered by the Baltimore Police Department. An insurer had paid $2,500 for the loss. However, the painting was apparently never reported stolen or missing to the London-based Art Loss Registry. A Baltimore Museum of Art spokesperson said they have special plans for the painting, which Saidie May had bequested to the museum in her will.